(Houston, TX) – Mother Nature was much kinder to Houston, Texas than Florida, giving ideal conditions to the contenders in the annual Houston Racing Festival at Sam Houston Race Park. 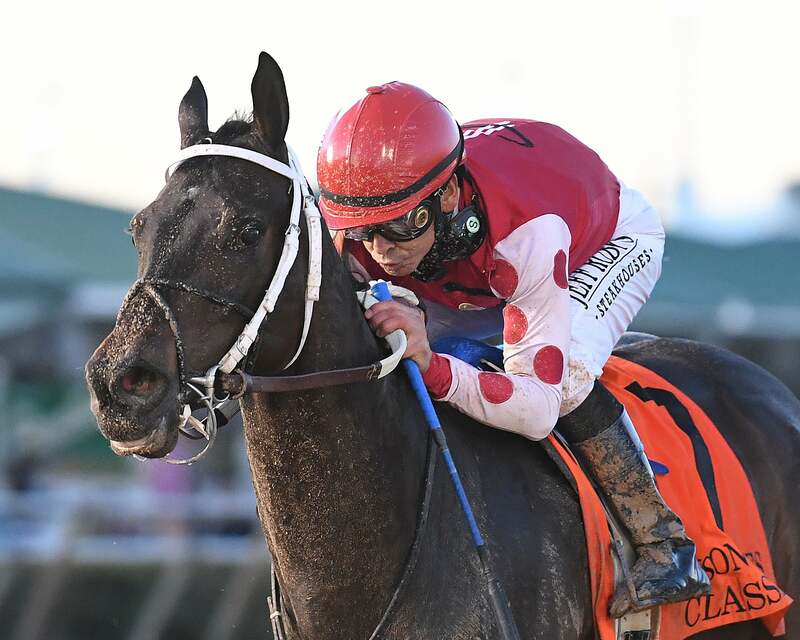 The marquee event of the 2019 Thoroughbred racing season was highlighted by exhilarating performances by Midnight Bisou in the Grade 3, $300,000 Houston Ladies Classic and a record seven wins for trainer Mike Maker in the Grade 3, $200,000 Connally Turf Cup. Midnight Bisou following her third-place finish in the Grade 1, $2 million Breeders’ Cup Distaff last November at Churchill Downs. The 4-year-old daughter of Midnight Lute is owned by Bloom Racing Stable, LLC, Madaket Stables LLC and Allen Racing, LLC and showed her class as she prevailed as the 1-9 favorite in the six-horse field. Top North American jockey Mike Smith made his first trek to Sam Houston Race Park aboard Midnight Bisou, trailing the field in the early stages of the race. Heavenhasmynikki ridden by Gerard Melancon went to the lead, setting fractions of :24.68; :49.38 and 1:13.38. Entering the final stretch of the mile and one-sixteenth feature, Moonlit Garden and Jose Ortiz took the lead briefly before Smith came with a final run. He finished on top by a margin of ¾ length in a final time of 1.44. 52. Asmussen made the trip to Sam Houston, where he won his tenth-leading training title last March. His runners have fared well here since the meet opened on Friday night. “She's a very special filly,” he said. “I had tremendous confidence in the surface here and felt it was the perfect spot for her to make her first start as a 4-year-old. Bloom manages all the acquisitions for Bloom Racing Stable and shared his evaluation of Midnight Bisou, who he purchased for $80,000 at the 2017 OBS Spring Sale of 2-Year-Olds in Training. The daughter of Midnight Lute out of the Repent mare Diva Delight was bred in Kentucky by Woodford Thoroughbreds. Midnight Bisou won $180,000 this afternoon, improving her career record to six wins from 12 starts and earnings of $1,715,000. Town and Country Racing’s Moonlit Garden earned $60,000 for her runner-up finish. Trained by Christopher Davis, the 5-year-old mare by Malibu Moon shipped to Houston off a third-place finish in the Tiffany Lass at Fair Grounds last month. Heavenhasmynikki owned by Looch Racing Stables Inc, completed the trifecta, followed by Prado’s Sweet Ride, Remedy and Viva Forever. Song From Above was an early scratch. Sent off as the prohibitive favorite, Midnight Bisou paid $2.40, $2.10 and $2.10. She joined an elite group of Houston Ladies Classic champions, including Forever Unbridled, Cassatt and Joyful Victory. Last year’s winner, Tiger Moth, has been retired and will be bred to Justify, which was announced last Thursday by Eclipse Award Winning Breeder John Gunther. The Grade 3, $200,000 John B. Connally Turf Cup, at the distance of one and one-half miles, attracted a field of nine, including two-time champion Bigger Picture. Owned by Three Diamonds Farm, the 8-year-old son of Badge of Silver, bred in Kentucky by Kenneth and Sarah Ramsey, made his 38th career start today under Jose Ortiz, his winning pilot in the 2017 and 2018 Connally victories. Settled from off the pace, Bigger Picture was unpressured early, but began picking off horses as he rounded the far turn. Ortiz had him in full control at the top of the stretch, rallying strongly, crossing the wire in 2.30.60 over the firm turf course. The chestnut gelding made his last start at Del Mar, running second in the Grade 2, Hollywood Turf Cup. His trainer, Michael Maker was pleased with the January 12 work by Bigger Picture at Palm Meadows in Florida, where he covered five furlongs in 1.02.80, signaling he was ready to return to action..
Zapperini, with Florent Geroux in the saddle, closed for second, by a margin of 3 ½ lengths behind the winner. Owned by Lloyd Madison Farms IV LLC, the 6-year-old son of Ghostzapper was sent off at odds of 15-1 and earned $40,000 today. Some In Tieme (BRZ), runner-up in last year’s edition of the Connally, ran third for trainer Efren Loza, Jr. Maker and Three Diamonds Farm ran fourth with Markitoff, a 5-year-old son of Giant’s Causeway, who was ridden by Mike Smith. Budro Talking, Net Gain, Cooptado and Lawless West completed the order of finish. Team Colors did not finish and was vanned off. Bigger Picture ($3.40) now has 12 lifetime wins, including six five graded stakes. He eclipsed the $1 million earnings mark winning last year’s Connally Turf Cup, and has amassed $1,4,94,135 since making his debut in 2013. Maker has won six of the last seven editions of the Connally with Papa Bodie in 2012; Admiral Kitten in 2014; Coalport in 2015; Da Big Hoss as well as the last three years with Bigger Picture. Bigger Picture is the second turf specialist in Connally history to win three times. That feat was accomplished by Glen Warren’s Candid Glen, who was victorious in 2001, 2002 and 2003.